On Sunday 14 April we opened the doors to our Cattery, and welcomed cat lovers of all ages to partake in an afternoon of feline-themed frivolity. As well as being an eggs-ellent opportunity to meet our resident cats and kittens, visitors could also buy or win animal-friendly toys and treats, and either take them home for their own pet to enjoy or ‘gift’ them to a cat in our care. Our Cattery staff organised a number of fun games and puzzles, including the opportunity to name a future kitten and a ‘Guess Who’ line-up of famous felines! Younger guests were also invited to join an Easter Egg hunt around our outdoor garden, and we had a whole host of stalls selling themed snacks, sweets, merchandise and treats. The event was sponsored by Edgard & Cooper, who generously gave away samples of their naturally tasty cat food throughout the afternoon, and brought along a ‘Spin to Win’ wheel which encouraged visitors to donate even more free treats to our furry friends. We are also incredibly grateful to 4Cats and Jin Designs, who kindly donated prizes for our raffle. 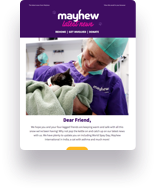 “Edgard & Cooper were really excited to support Mayhew at their brand new Cattery event”, added brand spokesperson Beanie. Spring time is otherwise known as ‘kitten season’ at Mayhew, as the weather warms up and more and more cats come out to play. Thankfully, the £2,300 raised this weekend means we can help even more cats and kittens in our community, and ensures we can continue to care for them until they find their fur-ever homes.